This week the framing inspection was passed and we saw the exterior wall insulation installed, one step closer to drywall. Things are starting to really get busy around here. MONDAY & TUESDAY - No pictures, busy doing other non-house related things. Siding on almost the whole 1st floor by the end of Wednesday. Also the fire blocking was installed. More heating vents installed this week as well. THURSDAY - Busy again, this time with pricing out our additional kitchen cabinets. Insulation installed, no more drafts for us. By the end of the week the 1st floor siding was completed. More siding next week. SATURDAY & SUNDAY - On Saturday, we did a little more pricing on the kitchen cabinets, making decision next week. On Sunday, I finished sanding the kitchen cabinets. After waiting for 4 weeks for our pre-painted siding to arrive, it finally did this week. Our house is really starting to look like a finished house. We have also been very busy deciding on kitchen cabinets, vanities, tile, etc... Here is what happened this past week. MONDAY & TUESDAY - Nothing happened these two days. At least nothing to take photos of. 1st day with siding!!! This was so exciting to see go up! More siding went up on Thursday. Even more siding and the vent for the gas heating was installed. On Saturday, I started the refinish our existing cabinets project. I cleaned and labeled all the parts and took off all the door and hardware with the help of my five year old. She thought it was great that she got to help. Also on Saturday, Aaron almost finished the deck stairs. He ran out of decking with one step to go. My Sunday project was sanding the cabinets. I almost finished the cabinets only one cabinet to go and all the doors. Aaron attempted to install the deck railing, it turned out to be incredibly hard to cut. We decided to leave this to the professionals. Things are starting to ramp up again, more exciting things to come. Not much to take pictures of this week. Our plumber had his rough inspection, the HVAC guy started his rough work and the electrician continued his work toward his rough inspection. On Monday the roofer was there and finished off the two roofs over the exterior doors and the back addition roof. TUESDAY - Nothing to take pictures of on Tuesday. The contractor poured the slab for the AC unit next to the bulkhead. This was the day that the heating guy started working on our house as well. HVAC had installed some of the vents for the upstairs heating in the ceiling. FRIDAY- Again no pictures for this day either. I did meet with the electrician and HVAC guy to talk about where lights and vents were going to go. WEEKEND - We continued to go shopping for vanities, cabinets and tile. Decided on the downstairs bathroom tile and the floor tile for the upstairs bathrooms. When we arrived back from Atlanta, we came back to a house with front doors. Our house is unique in that we have two front doors. Our house was built sideways, creating to accesses from the street with two paths. It was exciting to see these installed. Not much happened the rest of the week. We have begun to hit a lull in activity. The small shelf next to the kids tub was framed. The old kitchen counter-tops were removed. The rest of the wall demo was completed, no more baby animals on the old kids room wall. The slider that goes out to the deck was installed, love this! We now have access directly to our backyard. Here are our two new front doors, they are fiberglass doors that will have a mahogany stain. TUESDAY - First day with no one working on the house, because we are waiting on siding to be delivered. Hopefully, we will not have too many more of these. THURSDAY - My Dad and I took the opportunity to throw the rest of the junk from the basement into the dumpster. The plumber was also there to finish up a few things before the rough inspection. WEEKEND - My husband and I went shopping to price out lots of items for the house including the fridge, stove, cabinets, tile, sinks, etc..
My kids love all things arts & crafts. 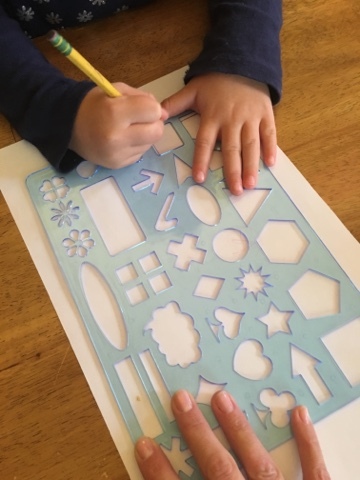 So, I was excited to test out this stencil set from Sillycuite. 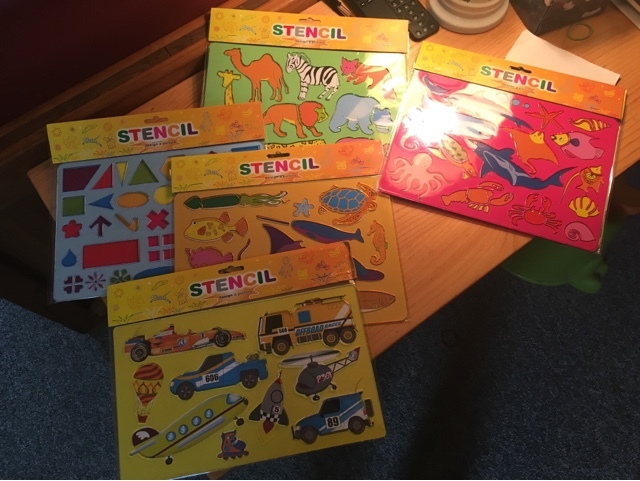 My kids liked all the different designs that came with this set, endless possibilities. We decided to test out the shapes set first. 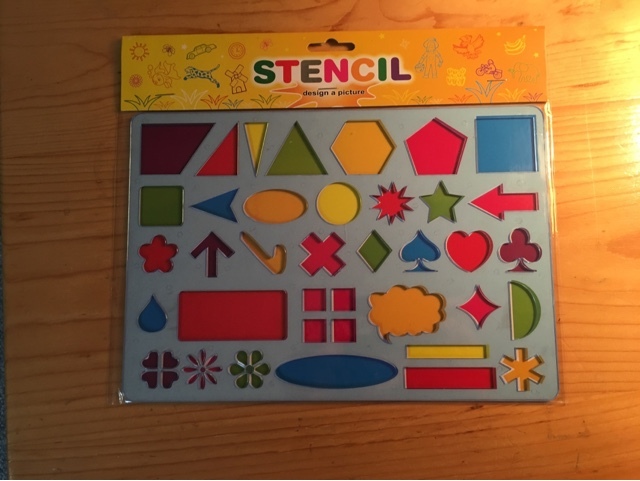 My five year old enjoyed using this stencil and tracing all the different shapes. Disclaimer- I received this product free of charge in exchange for a honest and unbiased review.